Information The original church building, known of old as "the meeting house" still stands solidly on the west side road, overlooking the picturesque fishing village of Hall's harbour on the Bay of Fundy. Communion is celebrated the first Sunday of each month. A fellowship lunch is also held following the third service of the month. 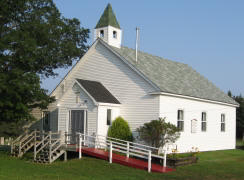 From May to October, services on the last Sunday each month are held at the East Hall's Harbour Baptist Church.